Sarah Palin, former governor of Alaska and former Republican vice presidential candidate, has completed her book. It’s entitled “Going Rogue: An American Life.” (According to Merriam-Webster’s Online Dictionary, rogue means 1) vagrant, tramp; 2) a dishonest or worthless person; 3) a mischievous person; 4) a horse inclined to shirk or misbehave; or 5) an individual exhibiting a chance and usually inferior biological variation.) Could they possibly have come up with a more perfect title? The printed version of the book, actually written by an unknown ghost author named Lynn Vincent, is scheduled for release on November 17, but most of Sarah’s fans will have to wait a while since the recorded version will not be out until the end of December. If you’re in the mood for some off-beat comedy, and lowbrow reading, you may want to pick up Mrs. Palin’s book. However, I’d suggest you wait a week or two after its release so you’ll be able to pick it up from the dollar a book bargain bin. At 400 pages of “wink” and “you betcha”, it’ll make a nice doorstop. Now we know that the flowers are getting moved and attacked by Staley. I caught her in the act today. I love coffee in all of its forms. Straight up, hot and black. I love it iced. I love lattes, and mochas, and macchiatos, espressos, and cappucinos. For the past five or so years I’ve been roasting my own beans, fresh daily, and have developed particular passions for Sumatran Mandeeling, Ethiopian Yirgacheffe, Tanzanian peaberry, and a few other varieties of coffees. Besides the coffee I roast, grind, and brew at home, there are very few places where I truly enjoy the coffee, due to rampant, crass commercialism that makes it difficult to find good varietal coffees in which to imbibe. There is a coffee shop near my home that does a phenomenal job, and whose varieties, ingredients, and techniques are top notch. But no matter where I’ve traveled and where I’ve tried the coffee, I have found none to hold a candle to the local shop and what I brew at home. I am not a fan of Starbucks and laugh at what McDonald’s calls “premium” coffee. McDonalds especially is turning out coffee that is simply undrinkable, not only due to the poor quality, but because of the troubling list of ingredients they put into the specialty drinks. Just a simple cup of coffee at McDonalds, not so bad all things considered, but if you get a latte or an iced coffee or some other premium choice, look out. If having the latte, watch out for the caramel syrup, containing, sugar, water, fructose, salt, caramel color (with sulfites), potassium sorbate, citric acid, and malic acid. Even the chocolate drizzle should be skipped since it contains corn syrup, hydrogenated coconut oil, high fructose corn syrup, glycerin, nonfat milk, cocoa (processed with alkali), food starch-modified, disodium phosphate, potassium sorbate (preservative), xanthan gum, artificial flavor (vanillin), salt, and soy lecithin. People, McDonald’s is not your friend. When they created an iced coffee drink and marketed it to you, they were not doing you any favors. Do not try to convince yourself that they are selling you a quality product for a low price. Premium Roast Coffee. Light Cream: Milk, cream, sodium phosphate, sodium polyphosphate, DATEM, sodium stearoyl lactylate, tetra sodium pyrophosphate, sodium hexametaphosphate, sodium citrate, sodium alumionosilicate, and carrageenan. CONTAINS: MILK. Vanilla Syrup: Sugar, water, fructose, natural (plant source) and artificial flavor, caramel color (with sulfites), potassium sorbate (preservative), citric acid, malic acid. Ice. Let’s take a closer look at the ingredients for a Vanilla Iced Coffee, shall we? Sodium polyphosphate – adds texture and is used as an emulsifier to prevent ingredients from clumping together. The Material Safety Data Sheet for this compound warns, “do not ingest”. DATEM is an acronym for Diacetyl tartaric acid ester of monoglyceride, and it is used for emulsification and foaming. It contains a series of esters which react across the chemical chain of water and fatty acids in various ways, some reactions of which are not fully understood. Sodium stearoyl lactylate is a solid powder which is irritating to eyes and skin, and can be hazardous in case of inhalation. Tetra sodium pyrophosphate, when ingested can cause nausea, vomiting, and diarrhea. It is toxic and mildly irritating. Toxicity is approximately twice that of table salt when ingested orally. It is sometimes used in household detergents to prevent clumps from being deposited on clothing. If the crystals of this compound become deposited in joints, they can cause the painful and inflammatory medical condition known as pseudogout. Sodium alumionosilicate is known to potters as albite feldspar, and is used as a ceramic glaze and strengthening agent. Sodium alumionosilicate is used in foods as an anticaking agent. Carrageenan – There is evidence from studies performed on rats, guinea pigs and monkeys which indicates that degraded carrageenan (poligeenan) may cause ulcerations in the gastro-intestinal tract and gastro-intestinal cancer. Poligeenan is produced from carrageenan subjected to high temperatures and acidity. A recent publication indicates that carrageenan induces inflammation in human intestinal epithelial cells in tissue culture. Consumption of carrageenan thus may play a role in intestinal inflammation and possibly inflammatory bowel disease, mutations of which are associated with genetic proclivity to Crohn’s Disease. The truth is, as should be seen from this information, McDonald’s Iced Coffee is not a drink with simply coffee, milk, and sugar. This is another reason to be selective about your food and beverage intake. The coffee based drinks I consume, for instance, are made with all natural ingredients, one drink at a time, and contain none of the list of chemicals cited above. Let’s all do ourselves a favor and stay out of the drive through. Monique Zimmerman-Stein has been nearly blind for the last two years from Stickler syndrome, a rare genetic disorder. She recently decided to forego her own treatment to save funds to treat her two daughters, who also suffer from the condition, reports Lane DeGregory of the St. Petersburg Times. The family is covered under husband Gary’s Blue Cross/Blue Shield plan, but that coverage only pays for 80 percent of medical expenses. She will no longer get treatment to preserve that last slice of light. The injections that might help cost $380 after insurance, and she needs one every six weeks. She could be spending that money on her daughters’ care. No one should have to make such sacrifices, said her husband. He hopes the new health plan will include a public option and won’t exclude people with pre-existing conditions — like his wife and daughters. The expensive care has already forced the family out of their home, which was foreclosed, and forced them to sell their furniture and to cash in their life insurance. What a strange hyperbole. Why would anyone equate a camel with the eye of a needle? Well, probably that isn’t what was said, or intended in the original Koine Greek in which Matthew was written. A more likely explanation is that the Greek word, kamilos, meaning camel, should be read as kamelos, meaning a cable or rope. Some later New Testament manuscripts actually have the latter word in this quote. Thus, Jesus, if he spoke to this issue at all, more likely said, “It is easier to thread a needle with a rope than for a rich man to enter into the kingdom of heaven.” It actually makes some sense if this is the case. 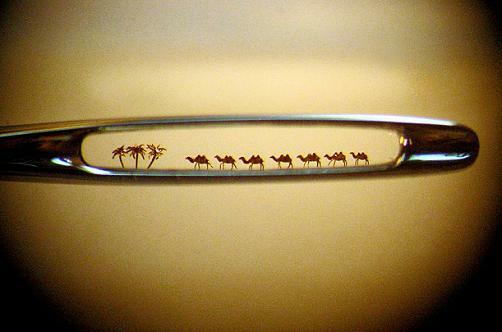 But now we have photographic proof that does indicate that several camels can actually pass through a needle’s eye at the same time, so maybe he was speaking of camels after all. Like many other issues raised in the Bible, we simply don’t know, and it probably doesn’t really matter.